Damascus VT/ Kurdish Popular Forces serving in Syria today captured a senior Turkish intelligence official who has, under “enhanced interrogation” implicated President Erdogan. VT was given access to recorded confessions which detailed the role of the MIT in the Brussels explosions along with plans for more attacks across Europe. The “suspect” has confessed his role in planning the Brussels attack in coordination with ISIS at Raqqah. Intelligence that led to the capture was supplied by a Russian signal intercept. We are told that no Russians were involved in the capture but that a Spetsnaz team may have been available for support. Turkish intelligence runs an operational planning center in an underground complex in Raqqah, according to our unwilling informant. The center, built under an athletic facility, contains stockpiles of chemical and biological weapons including sarin gas, swine flu and tons of materials for producing mustard and chlorine gas. The US hit the center in October 2014 in coordination with a Syrian “Tiger” unit which led to the capture of Qatari, Saudi and Turkish officers in one of less than a half dozen highly secret joint operations. The interrogation notes we received thus far from European Department for Security and information (DESI) Secretary General DR Haissam Bou Said indicted that Turkish intelligence MIT was behind the horrific twin suicide bombings and that Turkish terror cells across Europe had been planned years ago in coordination with an organized crime infrastructure long involved in human trafficking, narcotics and working with Israeli and Saudi groups staging false flag terror attacks. Erdogan, according to our source, has been channeling MIT trained terror cells hidden within the carefully orchestrated influx of refugees, directing them to “berths” within the Turkish crime communities long established in Germany, Belgium and the Netherlands. 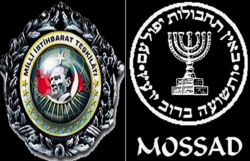 Sources in the US intelligence community note that the Turkish organized crime centered in Munich has, for over a decade, is “ground zero” for the expected onslaught of terror attacks expected to hit the US on the eve of the upcoming presidential election.